Standard: 6 l/min (+	2.34 US$ ) plus 1 x 3 l/min (+	4.09 US$ ) plus 2 x 3 l/min (+	10.53 US$ ) plus 3 + 5 + 6 + 8 + 10 + 12 l/min (+	2.34 US$ ) plus 1 x 8 l/min (+	2.34 US$ ) plus 1 x 10 l/min (+	2.34 US$ ) plus 1 x 12 l/min (+	4.09 US$ ) 2 x 5 l/min (+	5.26 US$ ) 3 x 5 l/min Zusatzregler/régulateurs suppl. ?/additional regulators? ohne GiroClic (Standard) (+	2.88 US$ ) +1 GiroClic à 5.90 (+	4.79 US$ ) +2 GiroClic à 4.90 + GiroClic? Save more than half your costs, water, CO2 and energy (e.g. 15 l / 4 US gal. heating oil per person per year for washing hands alone)! Get maximum comfort from a satisfying, splash free jet of water. 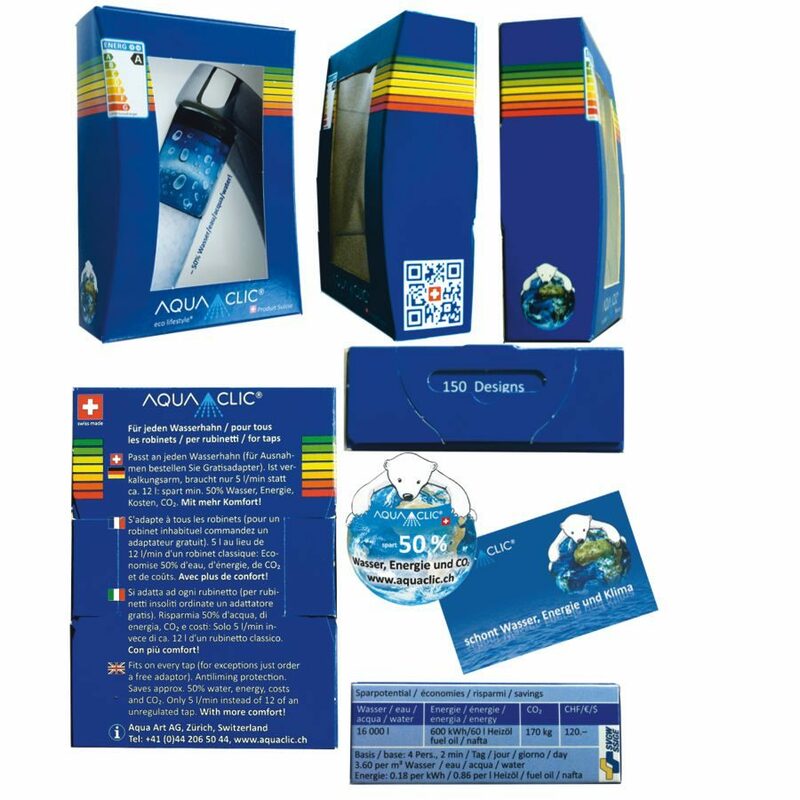 Fasten AquaClic to any faucet worldwide (adaptors are available for exceptions). 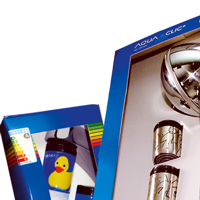 Surprise your friends or customers with an appealing personal gift. 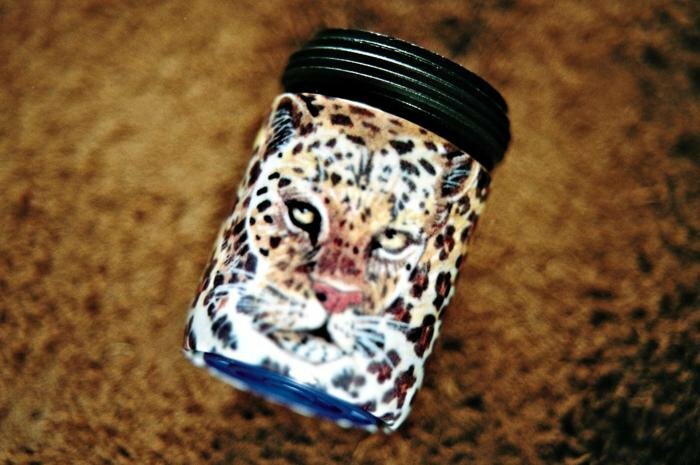 Choose from a wide range of attractive designs and various materials. the assurance that we, the Swiss manufacturers, will answer any questions you may have in a quick and easy way. Please note that AquaClics are unsuitable for pressureless water heaters. 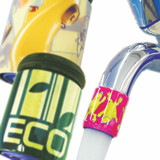 Tip: The included washer allows you to place your favourite side of the AquaClic to the front. Wash your hands, shave with only half of the water - why use more? Just washing your hands uses more than half a gallon / 2.5 litres of fuel oil per month! and you reduce CO2-emissions more than 500 kg / 1'000 lbs. In spite of using only half the usual amount of water, AquaClic patrons report no sense of diminished effectiveness. AquaClic’s water saving technology delivers a pleasant surge of water which can thoroughly rinse a sink full of soapy dishes. 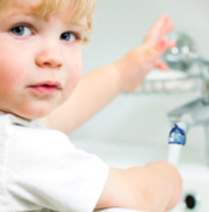 Ever tried to explain to a 3 year-old the concept of why saving water and energy is important? With AquaClic you can! In a playful and easy way! E.g. by updating his faucet with a dolphin-Clic. Or by using an energy-design-Clic that remembers on a daily basis that a lot of energy is necessary to have hot water come out of the tap. Colourful, discreet, romantic or elegant, the choice is yours: the wide selection of styles of the chic energy savers add flair, sophistication and humor to any bath and kitchen. 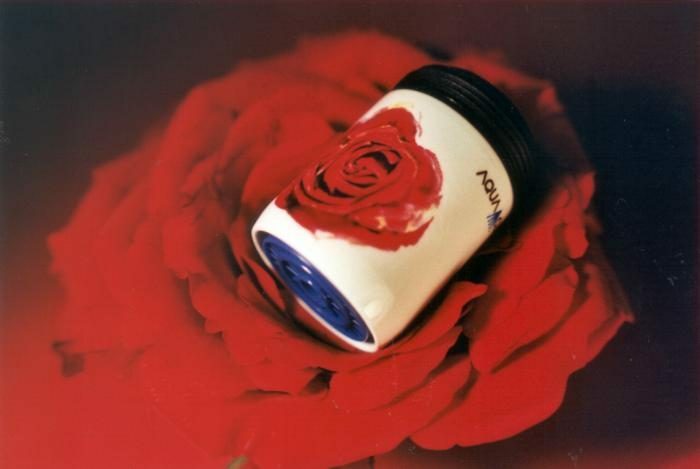 There is even the model “Pure” available, devoid of any design element. However, if you want to subtly encourage children, employees or tenants to save more water and energy, a “design”y AquaClic will be much more effective. Experience showed, that the “optical saving effect” saves even more money and water than just the AquaClic technology alone. 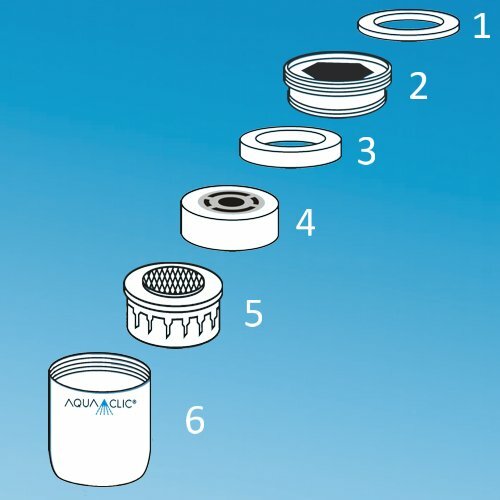 The filter inside the AquaClic remains free of lime scale 10-12 times longer than conventional metal filters. Why? 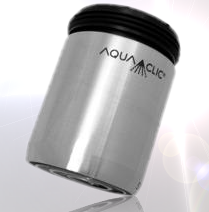 AquaClics are ecologically certified according to ISO 14001. For your sister's barbecue party? For a customer's anniversary? 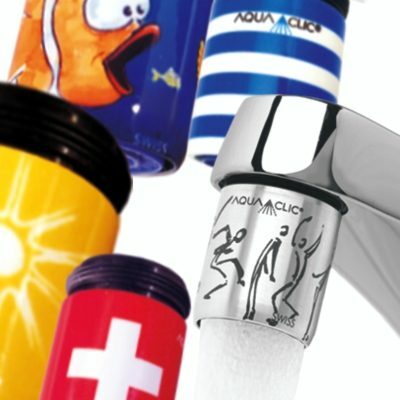 Whatever the occasion, AquaClics always make a good impression. 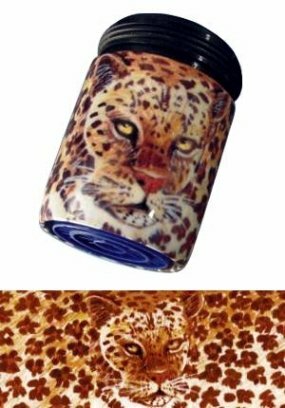 Choose from a wide range of different designs and materials and give your loved ones or customers a special, useful present. 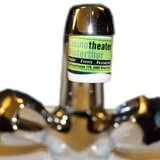 A plumbing accessory for advertising? A water-saver for public relations? 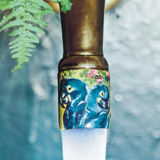 AquaClics on your taps demonstrate clearly to your staff and customers that ecology is important to you, and that you are actually conserving water and energy.